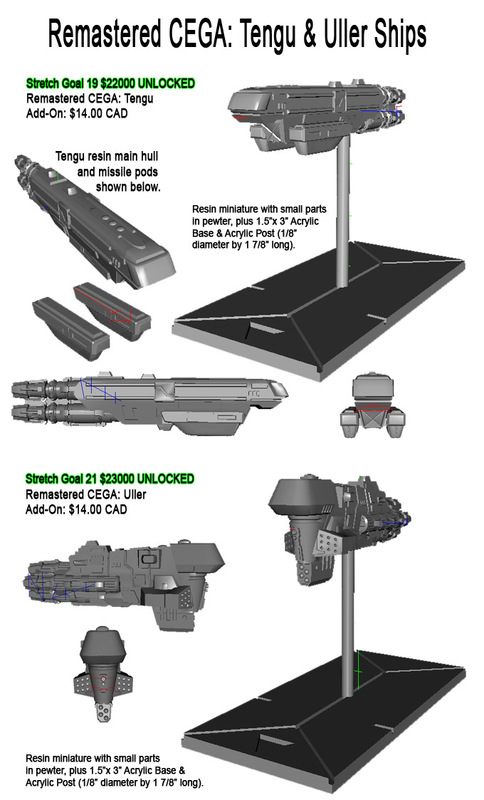 Dream Pod 9: Jovian Wars Post Kickstarter Update: Remastered CEGA Tengu & Uller Ships - New CEGA Hanger Add-On Parts! Tony finished remastering the CEGA Tengu and Uller ships this week, check out the image below to see how they turned out. Once the Pledge Manager is open, both ships will be available as Add-Ons, for an extra pledge of $14 CAD each. We added a few part/weapon upgrade mounting points on the Tengu (two on top and one under) and Uller (one on top and two on the sides). At first we tried putting the Hanger Add-On parts we made during the Kickstarter, but they didn't look that great as they were more designed to go on the Jovian Habitat Rings. So we took the time to design a new CEGA Hanger Add-On part that will be available in a pack of 4 for an extra pledge of $5.00 CAD, once the pledge manager is open. You can see in an image below what the new CEGA Hanger Add-On parts look like mounted on the Tengu, Uller, and sides of the standard CEGA habitat modules section shown on the Constantinople. We also added a few upgrade Add-On weapons on the top of the Tengu and Uller to show how the ships could look like fully loaded. With the addition of the CEGA Hangers Add-On we have decided to rename the original Hangers Add-On to Jovian Hangers Add-On. The remastered Javelin, Thunderbolt, and Athena ships for Jovian will be our next update this weekend and the remaster Godsfire should follow early next week and then the opening of the Pledge Manager later that week. 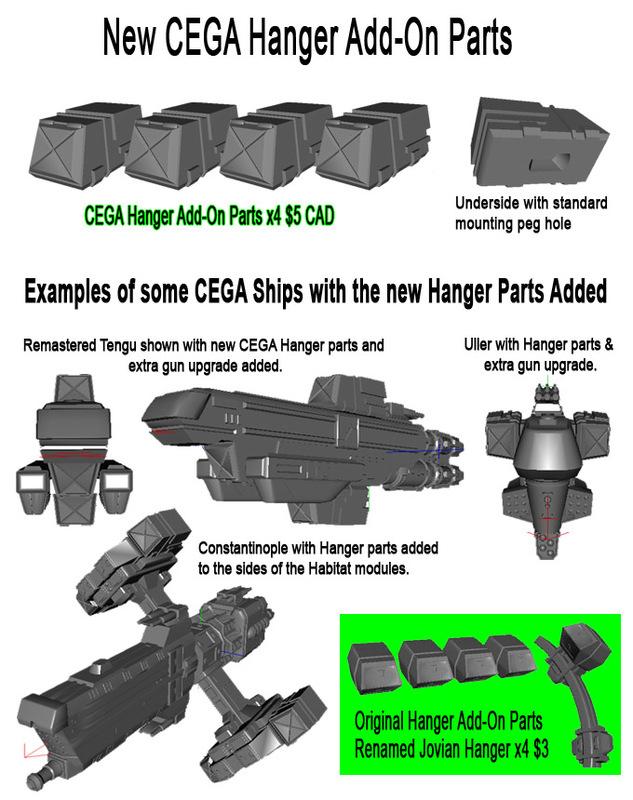 Home › Blogs › Robert Dubois's blog › Jovian Wars Post Kickstarter Update: Remastered CEGA Tengu & Uller Ships - New CEGA Hanger Add-On Parts!